Liverpool FC never listen to me, and they are usually correct not to. Quite apart from the club being a multi-million pound enterprise with multi-millions of very opinionated fans all over the world, I’m the kind of guy who gets agitated if I don’t have a glass of milk to go with a bar of milk chocolate. Not the kind of person you’d turn to in a crisis. But if only one request of mine could be acted upon in all my life supporting the Reds, it would be this – please persuade Luis Suarez to drop any appeal against his eight-match ban for using racist language against Patrice Evra. The club have stood behind Suarez up until now, and reading between the lines I think this is because Suarez has been privately quite vociferous at the way he has been treated. He didn’t think it was racist, he didn’t mean it to be racist and to accept the punishment would be to admit he is a racist. Reading Rodney Hinds in the Guardian’s Comment is Free relaying as fact Evra’s claim that Suarez used the term “at least 10 times” would be galling in the extreme for Suarez. Accepting as fact the account of a man whose evidence the FA dismissed as “exaggerated and unreliable . . . an attempt to justify a physical intervention by him which cannot reasonably be justified” when Man Utd made all manner of accusations against Chelsea’s ground staff after the post-match fracas at Stamford Bridge in 2008. Comments from Evra that he doesn’t think Suarez is racist are a case of shutting the stable door after the horse is bolted. Suarez will now be labelled a racist, and Evra’s attempts at who? me? will probably only add to Suarez’s feeling of victimisation. And make no mistake – Suarez is being victimised. Like so many organisations the FA is happy to sign up to high-profile campaigns to eradicate racism, encouraging clubs to employ the Moses-like cadences of their local George Sephton to read out stirring denunciations of racism (“in all its forms”) at matches. But actually doing something practical about it is a lot harder. No-one wants to be the one who tars someone with the tag of ‘racist’, and that’s even before you consider their hysterical reluctance to antagonise potential English internationals, exemplified by their hiring of some of the finest products of the Old Bailey to appeal on Wayne Rooney’s behalf to Uefa. To them, Suarez must have seemed like manna from heaven. While ‘El Pistolero’ seems like an engaging enough character in the few interviews I’ve seen with him, he isn’t a high-profile foreigner in the way that (say) Dietmar Hamann was during his life in England. There’s no danger of Luis putting down roots here and managing Stockport County. Then there’s his extended reputation. This is the man who once bit an opponent. This is the man who not only handled a goal-bound effort in the last-minute of the World Cup quarter-final against Ghana, but – gasp! – was unrepentant about it afterwards, thus reinforcing the image of the sly, pinch-the-lace-from-the-ball South American. There was no way the FA were going to let an opportunity like this slide to be Tough On Racism, and be seen to be Tough On Racism. To understand the depths of the cynicism, you only need to look at how they made sure Gordon Taylor was onside (how else to explain the delay over the weekend if not to get soundings from interested parties?) before they announced Suarez’s punishment – the same Gordon Taylor who in 1994 said, of England’s Brave Stuart Pearce’s alleged racist abuse of Paul Ince, that it was “in the heat of the moment . . . Stuart regrets what he said, and he’ll be ringing Paul to apologise. Hopefully that will be the end of it.” Times change – but not so much that Johnny Foreigner doesn’t get the blame. And yet, while sympathising with the plight of Luis Suarez, the overriding advice to the club remains the same: please persuade Luis Suarez to drop any appeal against his eight-match ban for using racist language against Patrice Evra. For a start, the chances of winning the appeal are practically nil. The FA is not like the criminal justice system with its notions of habeas corpus or reasonable doubt. It’s like a gentleman’s club where you sign up and agree to adhere to the rules, even if some of those rules permit you to be royally screwed. Take the charge of “bringing the game into disrepute”. It ultimately means “anything we bloody well like” and the FA have used it in that manner since the year dot. But even if they abuse that rule or apply other ones in a scattergun fashion, that doesn’t change the fact that they are following their own rules. Remember when Sheffield United objected to the punishment meted out on West Ham United over the illegal contract arrangements they had for Javier Mascherano and Carlos Tevez? Every effort by the Blades to get a meaningful punishment, i.e. a points deduction, foundered on the fact that the FA had followed their own procedures. The same will apply to Suarez. He was charged with using racial language, he was convicted of using racial language. End of. Any attempt to claim otherwise will have to overcome the fact of him, well, admitting he used language that could be construed as racist and is only going to be seen as being a nuisance appeal. But even if we ignore the kind of narrow legalese that keep QC’s in the cocaine-powdered wigs to which they are accustomed, you have to ask what the FA were meant to have done. As soon as it became clear that something was said, every eye belonging to those in (for want of a less pejorative term) the racism industry was turned on the FA. It’s all very well putting up hoardings and having high-profile players hosting training sessions in disadvantaged areas, but here was a high-profile player for one of the heaviest hitters in the world using dodgy language. Chris Rock once expressed regret that he had laden one of his acts with the ‘N’ word as he came to realise that people would point to his use of it as an excuse for their own use of it. You can be certain that if the FA had given Suarez a free pass the FA would be accused of introducing the thin end of the wedge. The next person who was charged with using dodgy language would say “well, you let Suarez off and what I said wasn’t that different to what he said”. It wouldn’t matter if this was hypothetical. The FA would still have to face the accusation, and it wasn’t unreasonable on their part to decide that it was better to err on the side of making a harsh example of one person rather than having to defend themselves for setting a lenient example down the line. Now let’s look at the reaction of Liverpool FC. I’m fairly certain that the rush to defend Suarez is less motivated by naked partisanship – our player, right or wrong – than genuine sympathy for a man who feels he has been wronged. But if ever there was a case for ruthlessly applying the notion that no man is bigger than the club, this is it. There has to be a point past which defending Suarez becomes counter-productive. We are heading down a road where any attempt to cast the FA as the villains will become increasingly problematic. In fact, the longer it goes on the more the FA will be tempted to cast themselves as standing up to racism in all its forms, a line of attack which will lead Liverpool to use the mantra about we being against all forms of racism too BUT . . . the ‘but’ will get more and more hollow with each invocation. Do Liverpool want to be that guy, the one who has many black friends BUT . . .? Some will say that’s not the point, that an injustice is an injustice no matter who it is meted out to. If you truly believe that then I suggest you give up following football and become an activist for Amnesty International. I’m proud of the fact that I’ve managed to get this far without mentioning John Terry, and I’m not going to mention how much worse his comments would be if he is proven to have said them and how the FA must be praying the problem just goes away – mentioning them there doesn’t count as a ‘mention’. And the only reason I’ll mention him is to ask people to be honest: you’re delighted Mongo is experiencing such discomfort and you hope the sobbing sap is nailed to the wall by the CPS or the FA or the PFJ or whomever it takes. For double honesty points which you can cash in against any future stay in Purgatory, admit that you’d feel none of the above if he played for Liverpool and would be holding a metaphorical pillow over your head going lalalalala every time you hear about the accusations. In short, you can believe that Suarez has been hard done by without having to think it is essential for the club to devote all its credibility to his defence. If that means he flounces off to the continent because we wouldn’t back him every step of the way, then so be it. No man is bigger etc. Perhaps (hopefully) the conversation has been had behind the scenes. We’ll defend you thus far, Luis, but there has to be a point where we cut our losses. It’s painful, but people will forget. When you see Jan Molby, do you see the fat Dane with the Scouse accent and the brilliant passing ability, or do you see the man who did six weeks of porridge for drink-driving? People’s memories for bad stuff among their idols has the life expectancy of a Wayne Rooney follicle. John Terry’s travails will soon swamp the headlines. We’ll stand by you. But we won’t go over the cliff with you. It’s make-up-your-mind time. For both player and club. This entry was posted in Liverpool, Shankly Gates, Soccer on 22/12/2011 by deiseach. The date was 2 May 2004. I found myself outside Anfield before a match without a ticket. For various reasons – it was only Middlesbrough, it was the tail-end of a less-than-stellar season (Gerard Houllier would be sacked a couple of weeks later), the money I was contemplating spending looked more useful going on my impending nuptials – getting inside the ground didn’t seem to be the most pressing matter in life. Yeah, I know, what a part-timer. Emboldened by this knowledge, I waited until a few minutes before kick-off then asked a tout, easily identifiable by their Uriah Heep-like demeanour (NB not really), how much a ticket would cost. “£45”, came the reply from the servile lick-spittle (NB not really). “Forget it,” I instantly declaimed, puffing my chest out in the manner of a cartoon astronaut (NB not rea . . . okay, you catch my drift). “Face value or nothing”. The tout knew the score. £25 changed hands and mere moments later I was in the Kop having triumphantly stuck it to The Man. The incident contained a few valuable lessons. For a start, my triumph was not quite as Caesar-like as I first imagined. The couple sitting beside me asked what I’d paid for the ticket. It seemed their son had had to cry off at the last minute and they’d sold the ticket at the ridiculously knockdown price of £15, so the tout had still made a decent profit on the transaction. Still, it taught me that touts, a species that hitherto I had considered to lie somewhere between Evertonians and amoebas on the food chain, can serve a useful function. With the best will in the world there are going to be circumstances where someone ends up with a ticket that they don’t need. In this case the couple were refreshingly realistic about what had gone down. 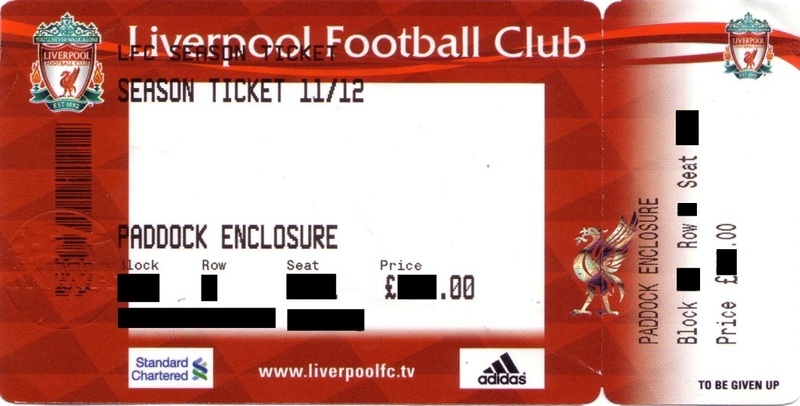 They were happy to take the hit on their ticket to save themselves the grief of hawking it around Anfield. So while I still think the tenth level of Hell is reserved for telemarketers and those selling a ticket for above face value, it was handy to know that someone shorn of the desperation of the day-tripper could pick up a ticket for face value by waiting until a few minutes before kick-off. Or so I thought. Because on 5 November 2011 when Liverpool took on the might of Swansea City it became clear that the world had changed. Having circled the ground enough times to leave a trench for future archaeologists to inaccurately speculate over and having three touts say they had nothing, one finally offered me a ticket for £150. 150 knicker! Five minutes after the match had kicked off! For Swansea City! Mrs d was in the ground with a season ticket that on a per-unit basis cost one-fifth of that! All of the above was rammed into the derisive “No!” that greeted such a preposterous offer. Ten minutes later the price had dropped to 60 notes. This was haughtily spurned as well, and in the end I was able to console myself with finding out that Stanley Park was nice at this time of year and not paying anything at all for the dross that followed. 150 quid! The truly astonishing thing is contemplating how much the touts must have been charging for tickets a couple of hours before kick-off to some pitiful day-tripper who had travelled from far, far away in the hope of gaining access to the Holy of Holies – and yes, I realise that strictly speaking I was day-tripping myself, but I know there’ll be other opportunities in the near future. Anyone who has come from anywhere which involved travelling across Runcorn bridge – happy birthday, bridge! – or didn’t go along the M62 would be tempted by those crazy prices rather than endure a wasted trip. And a lot of people will have come from a lot further away than that . . . This is the point at which articles about touts and ticket prices veer off into the won’t-someone-think-of-the-children territory, but we’ll leave that for another day. Besides, it’d be a bit cheeky to bemoan touts having tried to use them myself. If the club can’t come up with a proper system for keeping tickets out of the wrong hands – wasn’t that what the Fan Cards were meant to do? – then it’s inevitable that a secondary market is going to emerge, and it’s up to the individual to not tout their ticket rather than expect touts to go all Francis of Assisi on us. No, what really struck home about the prices being demanded is the staggering potential of the brand that is Liverpool FC. I realise that using terms like ‘the brand’ when it comes to a football club is anathema to most, the domain of ponytail and red brace-wearing ponces. But language is not neutral, and there’s no better term for explaining the value that lurks beneath the football club, the football club itself being [sickbag] like a mother’s love – priceless [/sickbag]. And it is that simmering Vesuvius of money-making potential that moved Ian Ayre to speculate recently on the merits of breaking up the cartel that is the Premier League’s collective bargaining deal with Sky. It’s often forgotten in the rush to pound the naked capitalism of the Dirty Digger – and throughout the ongoing phone-hacking scandal, few people have enjoyed News International’s discomfort more than myself – that the deal with Sky is a long way from naked capitalism. If a regular market consisted of twenty companies ganging together and selling their product exclusively on a five-year contract and splitting the proceeds amongst themselves, they’d be broken up faster than you could say Milly Dowler. When small clubs like Bolton and Everton (snigger) routinely bleat that they can’t compete with the moneybags clubs, they conveniently forget that there are far more brutal business models out there, ones that fit in much better with the anti-monopoly laws of the UK and the EU. Spain is the classic example, where each club flogs their wares individually. All the money inevitably flows to the duopoly that is Real Madrid and Barcelona. And it’s not hard to see something like that happening to Liverpool should we be released from the Bolshevik shackles of the collective Premier League deal. Just think of it. Liverpool can sustain a business model where people are willing to pay hundreds of pounds for a ticket to see them play Swansea City. And this is despite over twenty years of mediocrity (with one shining exception, of course). There was a joke doing the rounds after the recent Manchester derby that Citeh fans hadn’t seen their team give Man Ure a five-goal beating since Chelsea did it a few years back. It’s a gag that would be often be re-tooled to dismiss glory-hunting Liverpool fans. Yet that would be to ignore that a whole generation of Liverpool fans around the globe have adopted the Reds as their club despite a distinct lack of success. We are a leviathan, and the Lilliputians are holding us back. The sooner we cast off their pathetic threads, the better. And yet . . . Ian Ayre invoked the need to be released from said constraints by the need to be competitive in Europe. This makes sense. The long-run revenue projections of Madrid and Barca must dwarf those of any team in the Premier League – Man City are an obvious exception, but if Uefa succeed in making those rules on expenditure needing to be a percentage of turnover stick then they’re going to hit the skids soon enough. But is that how Liverpool really want to be competitive? We’ve shown we can cut it in Europe. Even at a relatively iffy period in that season we played them we swatted Madrid aside and have come out ahead in our various jousts with Barca over the years. The problem is that we can’t compete in England. Throwing out collective bargaining will benefit other teams too, Man Utd and Arsenal in particular. So while we may have fewer worries about playing Swansea, so would the other leviathans in England. All other things being equal we’d be no better off. In fact, the sense of anguish at repeatedly coming up short would be even more acute. And besides, do we really want to be That Team? The ones who snuffed out any lingering dreams that a Nottingham Forest or a Leeds United could aspire to charge through the divisions to the very summit? My heart says yes: screw every last one of them against the wall, LFC comes first every time. My head says no: you’d be reducing the top flight to a La Liga-style farce against a succession of embittered teams without any guarantee that it would give us the success we crave. What’s the solution to that conundrum? The answer, my friend, is blowing in the wind. . . This entry was posted in Liverpool, Shankly Gates, Soccer on 14/11/2011 by deiseach. Members of that exquisitely privileged club [season ticket holders] are ripping off fellow Liverpool fans in the most egregious manner possible. If they were to average £15 for every away ticket throughout the season, they would be two-thirds of the way to paying off their season ticket. The ghosts of Liverpool fans long dead cry out with frustration at this mockery of support for their club. Upon further reflection, I think I may have been too hasty. This entry was posted in Liverpool, Shankly Gates on 06/08/2011 by deiseach. When Robbie Fowler left Anfield for the first time, he took a little piece of me with him, specifically the piece that hero-worshipped men who played well for Liverpool. Admittedly it was a slightly shop-soiled piece of me. All of three picoseconds were spent pondering the hypocrisy of cheering for Paul Ince when he was signed by Liverpool, having previously expressed a fervent wish that the Kray twins would take offence at someone misusing the name of the Guv’nor . . . the notion that players could be more than simply very good servants went with him. When Steven Gerrard’s media boosters made a virtue of his loyalty despite his blatant flirtation with Chelsea, the overwhelming emotion was that I didn’t want that piece of my life back, a piece so treacherous that the Bee Gees could have written a song about it to be performed by Dionne Warwick. But the viper is back in the form of Fernando Torres. Looks like I was right the first time. Even if one comes from the perspective that all footballers are mercenaries, and I think we all accept that to a greater or lesser degree at this stage, they’re not equally mercenary (see: Cashley Cole). Fernando Torres seemed a little bit different from the norm, his famed armband typifying a player for whom money wasn’t everything. So to see the cynical manner in which he engineered a move away from Anfield took your breath away. We have it from the horse’s mouth that negotiations had been going on behind the scenes for twelve days prior to the transfer. The tapping-up doesn’t bother me. They’re all at it, including Liverpool (see: Charlie Adam). But had he revealed his desire to leave two weeks ago, Liverpool would have been in a better position to deal with it. In retrospect, the assumption that they were pursuing Luis Suarez to replace Torres was completely wrong. They were playing coy with Ajax in the hope that the player would demand a move and we could then get him on the cheap (see: tapping-up, Charlie Adam). Instead, Liverpool had to meet Ajax’s evaluation of the player and then desperately scramble around looking around for a replacement for Torres. Andy Carroll may well turn out to be a star, but at this moment he looks horribly over-valued – he is *assumes Lloyd Bentsen voice* no Fernando Torres. Is it any wonder that Mrs d, who I met at Anfield donchaknow, is gradually finding her relationship with Liverpool to be an increasingly painful one? And before you say that’s because we’ve been crap, she is having an increasingly more cheerful relationship with England – they’re crap too, but at least they’re identifiably her crap. So adios and thanks for the memories, Nando, of which there are many glorious ones. But thank you too for reminding me that no footballer is to be trusted. Don’t let the door hit you on the arse on the way out. So an old verity has been depressingly reinforced. But the last few weeks have seen another one loosen its grip on my psyche, i.e. the idea that pride and passion has no place in the running of a modern football club. The main reason I was content with the appointment of Roy Hodgson was that he could be relied upon to take a sober, serious attitude towards the business of managing Liverpool. No one would be signed because he had heart or guts or all those other things that a player can have in abundance and still be rubbish because he lacks such qualities as talent or skill. It was the cultivation of the latter qualities that made Liverpool great. Yes, Bill Shankly had talked about the passion, but talking the team up when they were due to play Ajax in the second leg of their second round tie in the 1966/7 European Cup hadn’t led to an improvement – first leg: Ajax 5-1 Liverpool; second leg: Liverpool 2-2 Ajax. And a few years later, after a cup defeat to lower division Watford, even he had to admit that he had persevered with the old stagers for too long. Compare this to Bob Paisley who ruthlessly trimmed any player as soon as they were past their peak. Result? A period of dominance that was without parallel in English football. Leave the passion to the fans, and leave the football to the mercenaries. That would be Roy’s philosophy. In addition, he also stood in the way on the nonsensical reappointment of Kenny Dalglish. One of the most entertaining things in football in the Premier League years has been the comical contortions at Newcastle United where great stock was put in quick-fixes, such as appointing a club legend to the post of manager. So we saw Kevin Keegan come back and Alan Shearer come in. Both started with much fanfare and talk of the passion, and ended in failure, abysmally so in Shearer’s case. The thought that Liverpool could go down that road, and there’s echoes of Kenny’s return in both cases, is an appalling vista. To compound the irony his last job was managing the Geordies, which was an amazing 13 years ago. If you were looking for someone called Dalglish with knowledge of football in the 21st century, you’d be better off giving the job to Kelly. You always become the thing you hate the most. During the repeated heaves against Houllier and Benitez part of the reason I was so defensive of them was that their critics seemed to be having it both ways. If they were failures in the end and got sacked, the I-told-you-so’s would be unbearable. But if they were eventually successful, the critics would be able to surreptitiously submerge their rage under the tide of celebration. Yet this is the position, barely a couple of weeks into Kenny’s second coming. It is, of course, early days, but even the first game at Old Trafford had positive signs. Not because the team played well – they did, but Kenny admitted he had nothing to do with the selection – but the sight of him standing alongside Alex Ferguson had a reassuring feel to it. When the likes of Jose Mourinho or Arsene Wenger take on Demento, their only weapon is their managerial wiles. And they will always, no matter how hard they strive or how well they do, lose out in the end. The roles are reversed in the case of Kenny Dalglish. Kenny is a footballer who can be mentioned in the same breath as Maradona and Pele, while Alex Ferguson is the bitter little man who wouldn’t bring Kenny to the 1986 World Cup – West Germany, Denmark and Uruguay were clearly going to be more cowed by the likes of Paul Sturrock. Do what you like, Alex. You’ll always look small next to Kenny. Then we were soon treated to Kenny’s biting wit. When Kenny was last manager, the media circus had yet to get to full three-ring status, so the stories of his zingers were just that – stories. Now we can see them in full Sky Sports News-a-rama. To begin with, we had his winding-up of the unfortunate Sky man after Andy Gray and Richard Keys’ infamous clanger. The video also shows him playing a dead bat to silly questions yet somehow not being obnoxious about it. Classy to his fingertips. None of this is to say that Kenny is going to return us to the glories of old. Things have definitely picked up, but Sunday against Chelsea and Whatsisname will be far more telling. It’s just that there’s a spring in the step of the club that is almost entirely down to the return of the King. In my commitment to keeping it rational, I’ve forgotten that a club is more than the sum of its parts. I was wrong to be so dismissive of the intangible. When Phil Thompson said after Istanbul that “Liverpool FC is the greatest club in the world”, he was channeling the spirit that produced that night to beat all nights. It weren’t Djimi Traore and Milan Baros who turned Milan over. It was Liverpool. Perhaps everything will go belly up in the next few months and I’ll regret ever committing these words to disk space. But right here, right now, Liverpool fans are smiling again. I’ll settle for that. This entry was posted in Liverpool, Shankly Gates on 04/02/2011 by deiseach.